Thanks to the integration of CodeTwo Email Signatures for Office 365 and Cogsworth, you can solve all problems concerning booking your time by adding a “schedule meeting” link to email signatures for all users. All your recipients need to do is click on the scheduling link you provide and choose what time works best for them. They will receive a confirmation email which will enable them to add the meeting to their calendar. Calendar items can be added to Office 365 and Google calendars with a single click. There is also an option to add the entry to a calendar with an ICS file, which works with most email clients. Thanks to that, you do not have to worry about your recipients’ email client or device. I am interested in the “Schedule a Meeting” integration with Office 365. I would like to have a free/busy view only calendar link in my outlook signature. If the only way to do that is to allow other people to schedule my time, it might not be worthwhile. Do you have an option that just lets them see my availability and then invite me to their event? Or with this one does the event show up in my calendar with me as the host? Cogsworth (the calendar integration provider) enables a synchronization of free/busy from Office 365 calendars. However, there seems to be no option to allow a view-only access to free/busy timeslots. 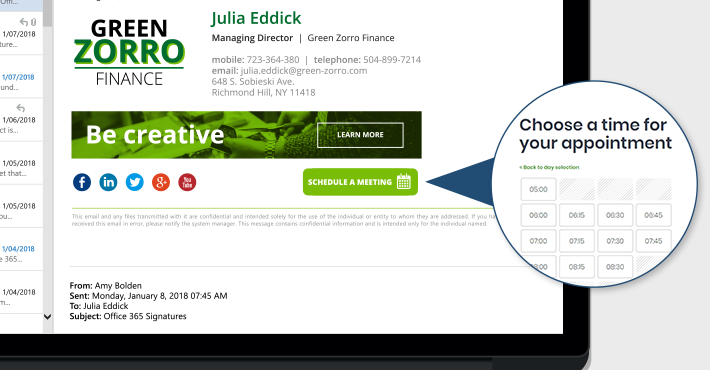 The meeting confirmation email allows you to add the meeting to your calendar and contains links which allow to reschedule or cancel a meeting request.